I know that (several) ex-NYCTA/MTA Old Looks were sold upon retirement to Jersey City-based "LAFAYETTE & GREENVILLE". Did any other Jersey "indies" (or companies in other areas) ever purchase other ex-New York Old Looks? I read somewhere that NYCTA did not sell their retired buses because if they sold them that meant they could still be used. Therefore, they were scrapped. However, the bus pictured in the first photo is definitely an NYCTA TDH-5106 from the 9000 series. But the second bus' New York City heritage comes into question. After carefully looking at the photo, and based on two items: 1) engine air intake above the last window; 2) the curved handrail by the windshield indicates that this bus is a TDH-4512. No NY City operator had this model except for Green Bus lines. And their 4512s had the round directional signals and Michigan marker lights. 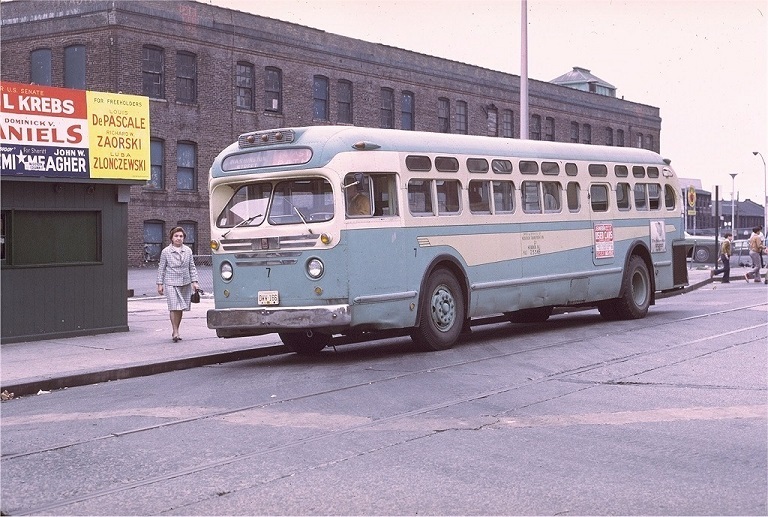 Queens-Nassau Transit and Steinway Transit had TDH-4509s with the type of directional signals, large arrow shape, but they had windows with split sash. The bus in the picture you posted, IMHO has a Public Service Coordinate heritage. PS had TDH-4512s with the arrow shaped directional signals. Lack of "GM" wings might be because PS installed their own "wings"
BTW, the photo of Lafayette-Greenville #215 is listed as an ex-NYCTA. That is incorrect. It has jack-knife rear door and arrow directional signals. Not equipment found on any NYCTA TDH-5106. Hoboken Transportation bus number 7 is an ex-Green Bus Lines number 112, a TDH-4512. Greatly appreciate all the stats and info you provided; thank you! How well l remember that particular Washington St. bus in Hoboken; long ago, Mr. Linksky (may our good friend RIP) informing me that the bus was an ex-GREEN BUS vehicle. WASHINGTON ST. lines was always a rolling bus museum, operating a real mixed back of second (and possibly third) hand relics. I easily remember those arrow-shaped directionals! How many times I rode those old Hoboken relics just for the fun of it; I still have an audio cassette I made on one of the Old Looks, recording a complete ride from 14th St. to the PATH tubes at Hudson Place. In the second photo, note that the ex-PS bus is still wearing its last PS colors, but has (of course) lost its PS insignias and nose "wings".